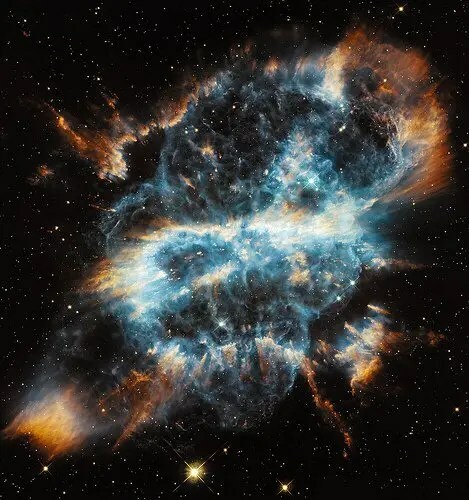 Hubble Telescope’s photo of the planetary nebula NGC 5189. I chimed in because who wouldn’t want to ask an astronaut a question? Fewer than 600 people have ever been in space in the history of the world — that’s roughly the average number of people within a social network. Being an astronaut is the rarest of occupations; going to space is the rarest of trips. Not all of my past departures have been bittersweet. But I do remember some well, particularly those that came after an extended stay. At 17, after a year spent living in northwestern Germany as an exchange student, I boarded the Deutsche Bahn with my host brother for one last pass through the countryside en route to the Frankfurt Airport. When the train slowed, I stood up to gather my unwieldy suitcases and give a hug to Jens. “You know we’ll probably never see each other again?” I said in German and in a matter-of-fact German way. Germany had made me stoic, but I could feel the sting of my words as the doors closed and the gangly shadow of my brother melted into a blur. Leaving Bombay almost a decade and a half later was much more hectic. I was six months pregnant, toting my adopted street cat, and traveling solo because my husband had two more months left on his diplomatic assignment. On the day of the departure, hours before I was scheduled to fly out, I traveled by taxi one last time to the shops of Colaba and Churchgate then back to my apartment on Altamount Road. On the return, I got a clear view of the sweep of Marine Drive, the Queens’ Necklace, Bombay’s most iconic street, which fronts the Arabian Sea. As we sputtered down the road, a Hindi pop song playing faintly on the car radio and the mingled smells of jasmine and burnt rubber and petrol and the heat of pre-monsoon May wafted in through the half-cracked window. Trapped in the thick of it — horns blaring, magazine sellers perched on the sidewalks waiting for traffic to snarl, Chowpatty Beach awash in the color of saris and chaat vendors — I glanced at what was now a wholly familiar scene trying to soak in the memory of the beautiful chaos. Although I was ready to say goodbye to this crazy town and excited to see family and old friends, I knew that this departure, unlike previous ones, signaled the end of a very long chapter in my life. I dreaded the 20+ hour journey that would transform me from expat to just another woman with a bunch of travel stories. My due date was still three months away, but I felt that this impending flight represented a life shift, the transition from independence to motherhood. I was saying goodbye to myself. When the inquiry about Commander Hadfield appeared in my timeline, these are the stories that came to mind. Soon after returning from his six-month mission on the ISS, Hadfield announced his retirement, a decision that he had surely made before he returned from the “huge yawning endlessness” of space. There’s the old adage that you can’t go home again. In truth, you can’t go anywhere again. Times change. You change. And you’ll never be able to recapture a certain moment, no matter how often you physically return to the place that it happened. Knowing this has always invited early onset nostalgia for me. So I can’t imagine how Commander Hadfield must have felt just prior to re-entry. Commander Chris Hadfield is the author of An Astronaut’s Guide to Life on Earth: What Going to Space Taught Me About Ingenuity, Determination, and Being Prepared for Anything. Oh, Melanie, I’m SO excited to tell you this: Yours was the last question of the night. I didn’t phrase it as well as you did, I was nervous and all keyed up. But I did ask if there was sadness at departure, and Chris — “Call me Chris, please!” — said that he’s not sad because he’s just so tremendously satisfied with the work he’s done, with his time in space, with how everything came together. It was a beautiful perfect question to end the night on, and a such a perfect answer. I was so grateful to you for the chance to end on a note that everyone in the room was completely moved by. Thank you so much.